The good news is, revving up a little esprit de corps does not require a weekend retreat in the woods or a rock climbing expedition. Sometimes team building can be as simple as taking your work group on an afternoon bus trip to do something fun. Yes, you read correctly. We used the words “work” and “fun” in the same sentence. You may think that having fun at work is synonymous with goofing off. But research proves otherwise. Co-workers who have fun together tend to be more productive, creative, and cohesive. A happy workforce translates to less absenteeism, lower employee turnover, fewer performance problems, and less internal conflict. Who knew? The truth is, we all need to take a break once in a while, just to decompress or recharge our batteries. So, the next time your department finishes a high-pressure project on time, reaches its quarterly sales goals, or, for that matter, suffers a disappointment, consider a group get-away. If you’re worried about losing a day’s productivity, statistics seem to support the idea that you’ll actually get more productivity out of your team if you provide some downtime. And if you can invest that downtime in team bonding, you’re likely to reap even more dividends. Step 1: Get out of the office. No offense, but the workplace is for work (hence the name), and as such is not the ideal environment for relaxing and having fun. Step away from the phones, the email, the texts, and the budget reports — even if you go no further than a local park or restaurant for a few hours. Step 2: Hop on a luxury motorcoach. For less money than you might think, this one simple splurge can have a huge impact on your team’s morale. 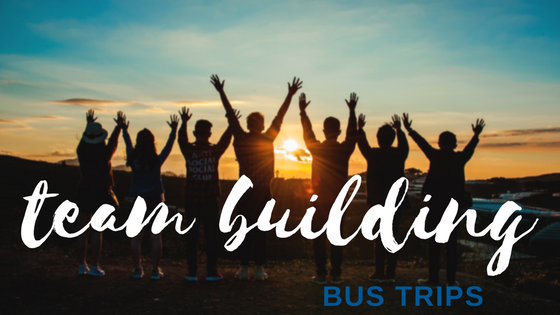 The moment those bus doors close, your group will have the sense that they’re doing something out of the ordinary: You’re all going somewhere, together and you’re doing it in style! Leave the work world behind, let someone else do the driving and just enjoy the novelty of the plush accommodations and comfy ride, combined with the delicious break from the pressures and responsibilities of work. This simple breakaway can have a magical effect on the mood of the group and the tone of the outing. Show a DVD, play a little music, sing some songs, serve a snack, or just sit back in the reclining seat and relax. Bus rides are fun. If your goal is to create a relaxed, stress-free environment where people can feel comfortable and enjoy each other’s company, a luxury motorcoach is a very nice place to start. Step 3. Go somewhere and do something. Be a tourist in your own town. Visit a monument, tour a historic site, see a new art installation or museum exhibit, spend a few hours at the zoo. Volunteer. Put in a few hours at a homeless shelter or food bank, participate in an environmental cleanup, or donate blood. Not only do you help others, you also get to share a meaningful experience with your colleagues, reinforce your company’s values, and do something completely out of the ordinary. Play outside. Go to an amusement park or water park, go tubing or rafting, play miniature golf, drive go-karts. Activities that increase your adrenaline also promote bonding. Relax. Go to a park or lake for a picnic. Promote health and fitness. Put on an office Olympics. Hold a walkathon for a cause. Sponsor a company 5K or 10K. Celebrate. Have a party or go out for a nice meal. It doesn’t have to cost a lot or take a long time to build camaraderie, improve morale, and create a climate of cooperation. Having fun together stimulates creative thinking … which can stimulate future productivity. Sometimes the best way to accomplish something at work is to take a little break from it. Your motorcoach awaits! Need help understanding the steps to booking a motorcoach? “The Complete Guide to Booking a Bus” is a great place to start. Professional event planners helped us compile the guide for people that are booking a charter for their group. It is a quick read and a wonderful reference for creating the right travel experience. Just click here to get your copy. If you need a quote for your off-campus trip, click here.